Summertime is a time for sunshine fun, BBQ and short shorts and bathing suits; but it is also a time for those pesky mosquitoes. Nights are just ruined by being attacked by the drove of disease-carrying bloodsuckers while sitting outside on a warm summer’s evening. You may want to buy some chemical stuff to repel mosquito, but here is a better and healthier solution. The Homemade Mosquito Repellent Lamps work amazingly effective. The project is very easy to do. 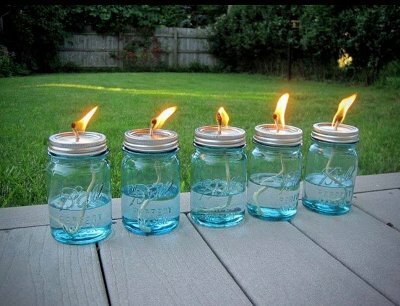 All you need is some mason jars, citronella and a wick. It takes as little as 5 minutes to get it done. That’s really all it takes to help keep the mosquito population down in your yard and porch area. With the help of these Homemade Mosquito Repellent Lamps, we can truly enjoy evenings of the coming summer.